Polynesian Blue is set to become Virgin Samoa as Virgin Australia continues its rebranding campaign. Under the relaunch, Virgin Samoa’s single 737-800, named Tapu’itea, has been repainted in Virgin Australia’s red and white livery, but with a few Samoan touches such as a palm tree painted on the fuselage and a tatau pattern on the engines. The pattern will also feature on neck ties and scarves worn by the airline’s crew, who will wear uniforms otherwise similar to Virgin Australia’s. Virgin said the changes will take effect early next year. Polynesian Blue was launched as a joint venture between the Samoan government and Virgin Blue in 2005. 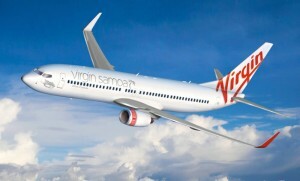 Virgin Blue relaunched as Virgin Australia earlier this year, and parent company Virgin Blue Holdings Ltd was renamed Virgin Australia Holdings Ltd this month. The name changes come as Virgin moves away from its heritage as a budget carrier and stakes its claim as a full service airline.